As I get ready to jet off to San Francisco for 2 nights tonight I thought I'd post what I have packed in my beach bag for the Hawaiian leg of our trip when I hope to spend far too much time laying around the pool in bright sunshine. 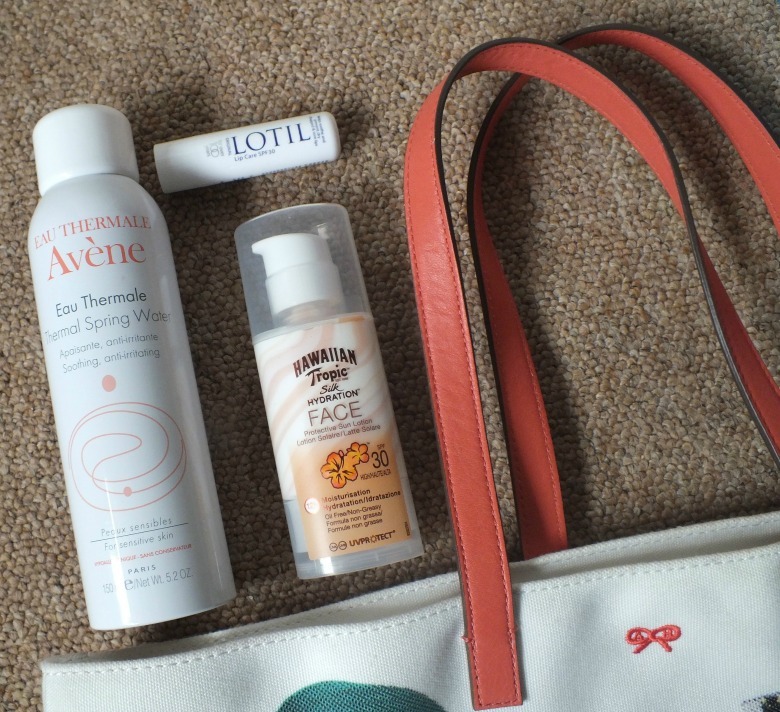 My Anya Hindmarch beach bag which I brought last year and finally have an opportunity to use are the famous Eau Thermal Avene Water Spray*. 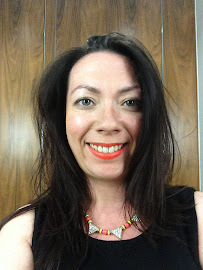 Last week I went for breakfast with Avene team and learned all about the famous thermal spring water from Avene and was lucky enough to come home with the water spray. Whilst it is a hard life sitting out in scorching sun for hours on end it can get a bit too much and I think a spritz from this water spray will be just thing. It's also a handy holiday addition as it can provide relief to sunburn and razor burn and the link so will certainly come in handy. When the Hawaiian Tropic team heard I was heading for the beaches of Hawaiian they kindly sent some items from the range, first up the Hawaiian Tropic Silk Hydration Face Lotion*. I adore Hawaiian Tropic and the smell of their products is amazing but I've never used the products for the face before so I can't wait to try this. I've covered products from Lotil on the blog before and Lotil Original Cream which I reviewed here will definitely be packed for any requirements and I can't wait to use the new Lotil Lip Balm*. Originally I had in mind that I would treat myself to my favourite Elizabeth Arden Lip Protectant in duty free for my trip but when I received the Lotil Lip Balm I was impressed with their similarities and knew that I would happily use this far cheaper alternative during my holiday especially thanks to it's added SPF 30. When I was in the market for a new lip balm a few months ago I couldn't believe some of the prices but at £1.18 for Lotil's version I think it's a winner. I'll be back with reviews of all the beauty products when I return from holiday and have put them all through their paces. 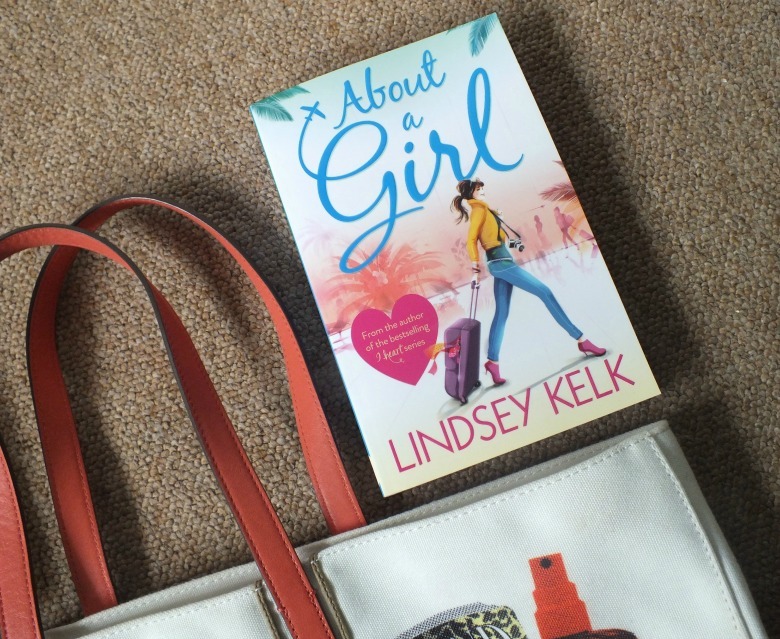 No holiday is complete without a book to read from your sun lounger and when I saw that About the Girl by Lindsey Kelk was 'about a girl' running off to Hawaii I couldn't resist (notice a theme following!). I love Lindsey's I Heart series so I'm sure this will be just as enjoyable. Finally I have some more delicious smelling products from Hawaiian Tropic, a new bikini from good old Marks and Spencer and my new orange Haviana Slim flip-flops. I think I'm set for the beach now don't you? Let me know what your beach essentials are and if you think I'm missing anything. Hope you have the best of times, I'm very envious! I adore that beach bag, its very "me"! I hope you enjoyed your birthday too, I know it was tinged with sad memories - thank you for commenting on my blog - safe trip Victoria. Yes, you're missing me = stowing away in your bag! Ooooh Victoria, I'm so excited for you to go on your trip and hear about all of your adventures!!! My holiday just isn't complete without a ton of chick lit either! !